Download "Macroeconomics Instructor Miller GDP Practice Problems"
1 Macroeconomics Instructor Miller GDP Practice Problems 1. Gross domestic product in the economy is measured by the A) total number of goods and services produced in the economy. B) dollar value of all final goods and services produced in the economy. C) total number of goods produced in the economy. D) total number of services produced in the economy. 2. In calculating gross domestic product, the Bureau of Economic Analysis uses the sum of the market value of final goods and services produced. This means that the BEA A) simply counts the total number of goods produced in the market place and then adds them up. B) values goods at their market prices, multiplies them by the quantity produced, and then adds them up. C) simply counts the total number of goods and services produced in the marketplace and then adds them up. D) values goods and services at their market prices, multiplies them by the quantity produced, and then adds them up. 3. Which of the following goods is directly counted in GDP? A) the lettuce that Subway purchases for its sandwiches B) the bread that Subway purchases for its sandwiches C) a 12-inch Subway sandwich purchased by a student D) the plastic bags that Subway purchases to wrap its sandwiches 4. Suppose, in 2012, you purchased a house built in Which of the following would be included in the gross domestic product for 2012? A) the value of the house in 2012 B) the value of the house in 2003 C) the value of the house in 2012 minus depreciation D) the value of the services of the real estate agent 5. A car that is produced in 2012 is not sold until According to the definition of GDP, in which year's GDP should it be counted? A) 2012 B) 2013 C) Half of the sales price will count as part of 2012 GDP and half will count as part of 2013 GDP. D) The production cost will count as part of 2012 GDP while the sales price will count as part of 2013 GDP. 3 13. Gross domestic product understates the total production of final goods and services because of the omission of A) intermediate goods. B) underground economy. C) household production. D) both B and C. 14. A sharp increase in the divorce rate increases the number of lawyers hired to determine divorce settlements. This will A) increase GDP and increase well-being in the economy. B) increase GDP but decrease well-being in the economy. C) decrease GDP but increase well-being in the economy. 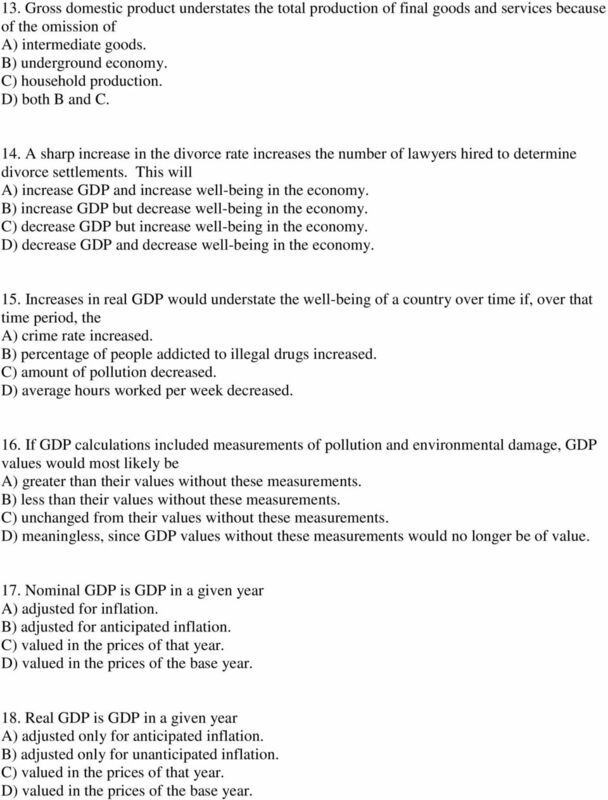 D) decrease GDP and decrease well-being in the economy. 15. Increases in real GDP would understate the well-being of a country over time if, over that time period, the A) crime rate increased. B) percentage of people addicted to illegal drugs increased. C) amount of pollution decreased. D) average hours worked per week decreased. 16. If GDP calculations included measurements of pollution and environmental damage, GDP values would most likely be A) greater than their values without these measurements. B) less than their values without these measurements. C) unchanged from their values without these measurements. D) meaningless, since GDP values without these measurements would no longer be of value. 17. Nominal GDP is GDP in a given year A) adjusted for inflation. B) adjusted for anticipated inflation. C) valued in the prices of that year. D) valued in the prices of the base year. 18. Real GDP is GDP in a given year A) adjusted only for anticipated inflation. B) adjusted only for unanticipated inflation. C) valued in the prices of that year. D) valued in the prices of the base year. 4 Year Guns Produced Price of Guns Butter Produced Price of Butter $5 40 $ Consider the following data for Tyrovia, a country that produces only two products: guns and butter. 19. Refer to the above table. Real GDP for Tyrovia for 2011 using 2005 as the base year equals A) $1,140. B) $880. C) $690. D) $ Refer to the above table. Nominal GDP for Tyrovia in 2011 equals A) $1,140. B) $880. C) $690. D) $ If the quantity of goods and services produced in the economy decreases, A) it may be possible for real GDP to increase. B) real GDP would certainly increase. C) it may be possible for nominal GDP to increase. D) nominal GDP would certainly increase. 22. Which of the following could cause nominal GDP to decrease, but real GDP to increase? A) The price level rises and the quantity of final goods and services produced rises. B) The price level falls and the quantity of final goods and services produced rises. C) The price level rises and the quantity of final goods and services produced falls. D) The price level falls and the quantity of final goods and services produced falls. 23. Which of the following could cause nominal GDP to increase, but real GDP to decrease? A) The price level rises and the quantity of final goods and services produced rises. B) The price level rises and the quantity of final goods and services produced falls. C) The price level falls and the quantity of final goods and services produced rises. D) The price level falls and the quantity of final goods and services produced falls. Supplement Unit 3. Gross Domestic Product (GDP): What Is It and How Is It Measured? These are some practice questions for CHAPTER 19. Each question should have a single answer. But be careful. There may be errors in the answer key! GDP: Does It Measure Up? May 2013. Classroom Edition. An informative and accessible economic essay with a classroom application.